Well, we’ve just had a wonderful week with the work retreaters! What a band of lovely human beings! There’s been so much laughter and fun through the week and we also got loads of work done in the garden and some overdue tidying up of paintwork in the house. A delivery of manure has been mixed with leaf mould, soil has been replaced in the old greenhouse ready for the new one to go up, the whole garden has pretty much been weeded, garden compost has been put on the cut- flower bed and the first bed of the long border by the tennis lawn has been stripped out ready for planting. In the house, much of the gloss work has had its chips and dents touched up with paint where luggage and vacuum cleaners have taken their toll! We’ve also picked the remaining loganberries and blackcurrants, potted on the brassicas and cleared masses of garden waste from the compost area to a skip. 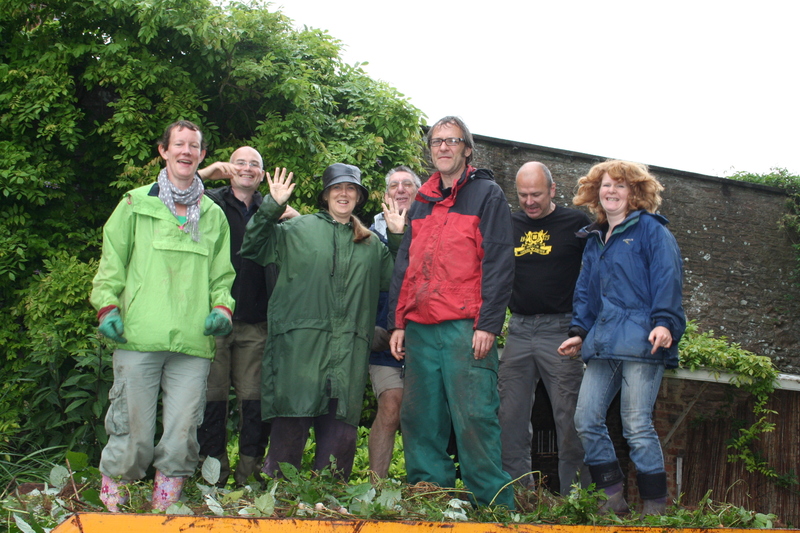 We managed to maximise the skip by dancing on the debris in it at regular intervals to compact it – either individually or in groups(!) – and this became quite a source of entertainment as the week went on! Just like a green trampoline! What always feels so magical about these weeks is how they unfold organically. There’s the work in the morning which is a great way to spend time together, but then there’s also the connections made over cups of tea, taking walks together, giving and receiving sessions and generally hanging out at Poulstone. We had a film evening one night, a few of us sat around the fire another evening and we had a field trip out to the local arts cinema at the end of the week. Then on the last night we had a real treat; Austin Keenan, the partner of Hilary who cooks for us, came and told us folk and fairy tales by candlelight. It was spell-binding and we managed not to embarrass ourselves by falling asleep en masse after a week of fresh air and physical activity! The Friends’ Day on the Saturday was also really lovely. Four people dropped in for lunch and then we were joined by a few others later in the afternoon for tea and cake. 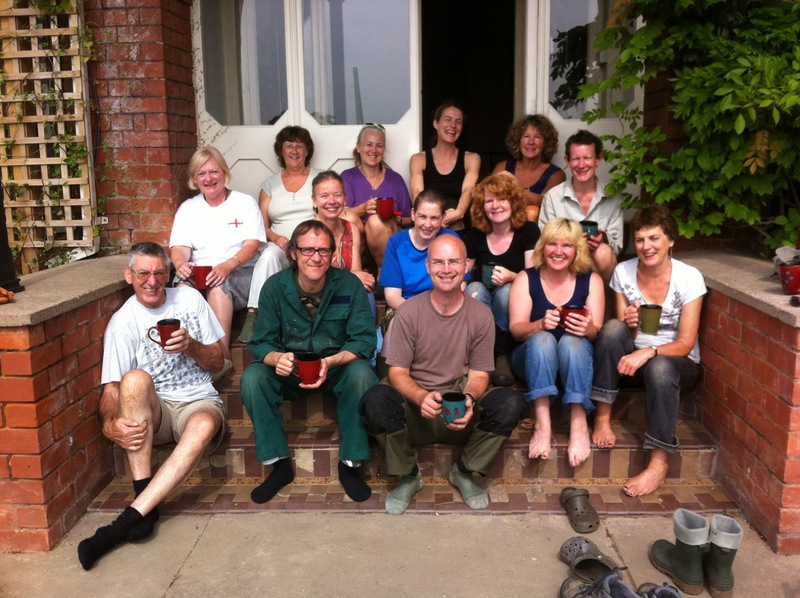 People drank tea on the front step in the time-honoured tradition, caught up with old friends, went for walks or enjoyed the gardens and had a look at what had been going on during the week. It felt perfect in a very low-key kind of way and people said they enjoyed the opportunity to just be at Poulstone and hang out here for a while. 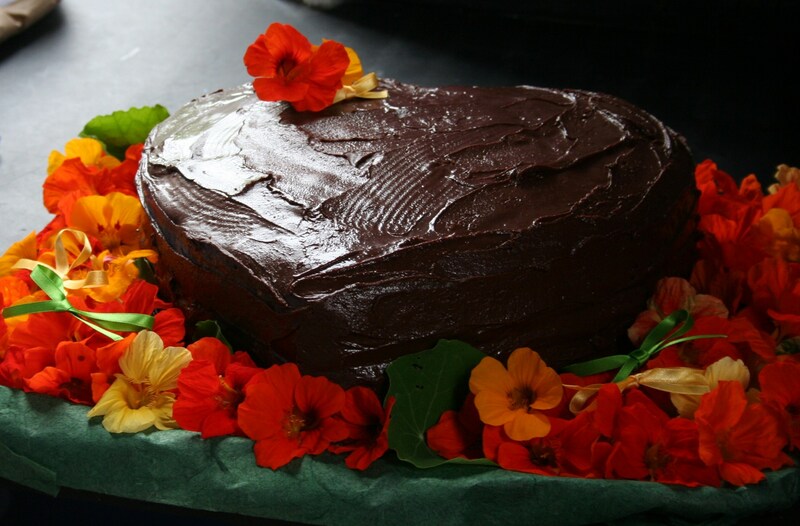 Thank you so much to those of you who came – it was kind of you to travel so far for a chat and a piece of chocolate cake! A few people stayed on for supper and the story-telling. A great day! It’s a bit of a double-edged sword when groups cancel. 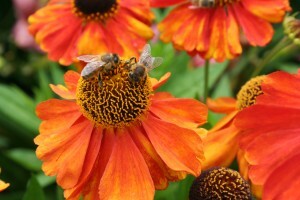 After the initial “Oh no”, very quickly follows the “Oh yes” of a bit of less-busy time. So we’ve just had a couple of weeks to catch up with some pressing jobs in the garden and take some nice long walks around the area to counteract the middle-aged spread! We spent about five hours on the Wye Valley Walk from Poulstone to Mordiford on a blazing hot day. It was gorgeous – a lot of the walk was through the dappled shade of woodland as well as blissful little sections along the Wye, amongst pink flowered hog weed, clematis and dragonflies of the most exquisite electric blue, turquoise and metallic green. Beautiful. 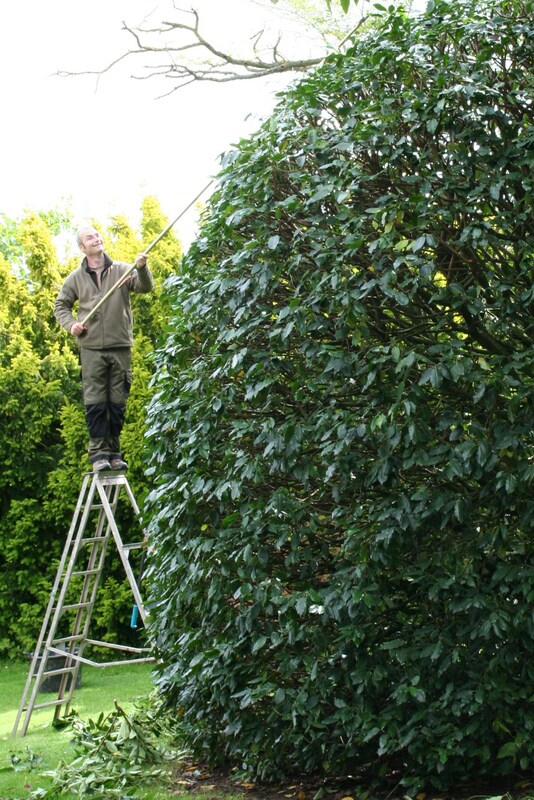 In the garden, Steve has been tackling the yew and laurel bushes by the Buddha which badly needed pruning, having gone rather bald in the middle and ballooned out on the outside, swamping the poor walnut tree. 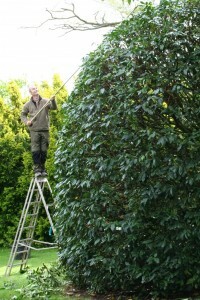 As you can see, he applies a high degree of health and safety considerations to his work……! We’ve also been trying to catch up with the fruit-picking which is getting away from us, as other things have had to take priority. Sometimes we just have to say we didn’t have time and the birds will be grateful for the food! 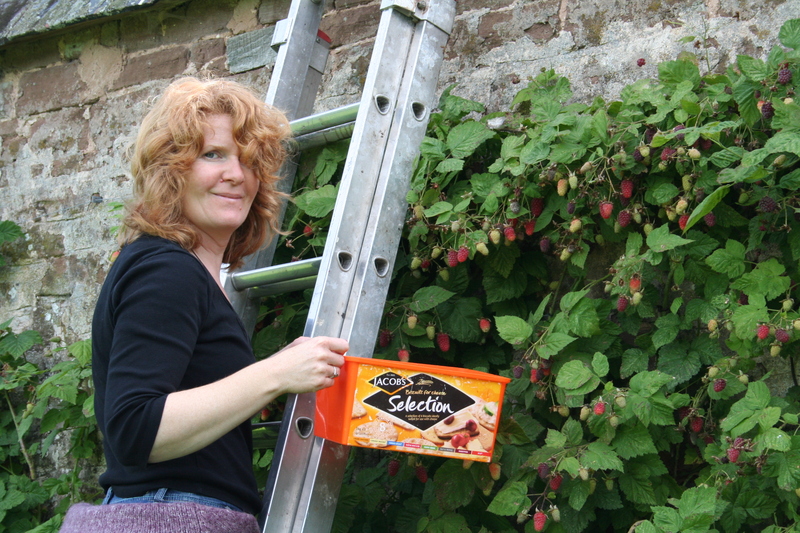 Mel has been picking loganberries and redcurrants, and the blackcurrants are starting to need picking now. 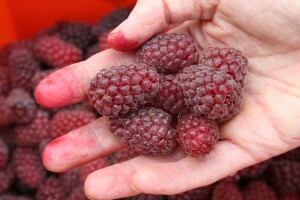 The loganberries are already featuring in berry trifles and other puddings. We’ll also freeze a lot so groups across the year get to sample them. And Poulstone has been given a new greenhouse! Some clients of Dave (our once-a-month gardener) very generously offered us their old greenhouse if we were willing to go and dismantle it. 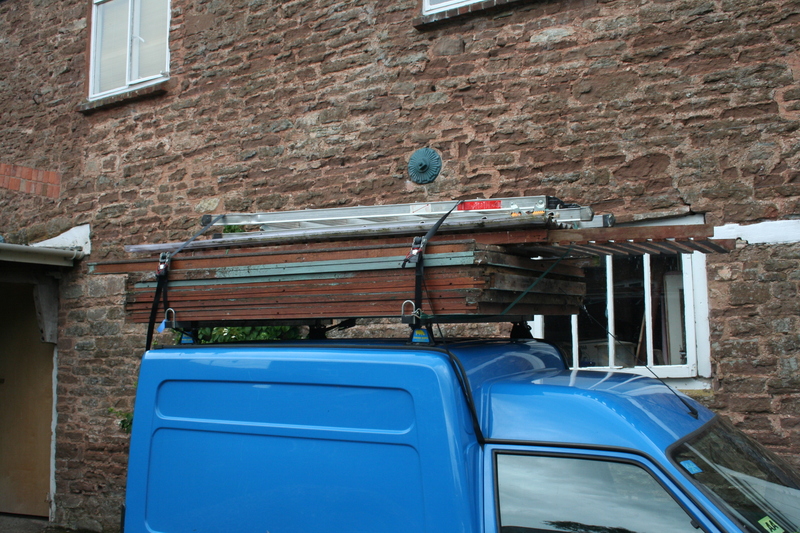 So we went off to their home on the outskirts of Hereford and took it down and lashed it to the top of the trusty van and brought it back to Poulstone. Amazingly only one pane of glass got slightly cracked during the whole mission! 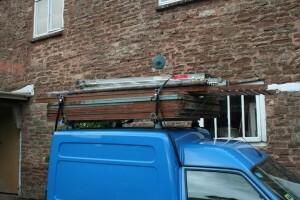 Steve’s been spending time dismantling the dilapidated old greenhouse here, ready to install the replacement. We’ll be able to go back to growing tomatoes, peppers, basil and so on in the greenhouse without Gail feeling she should be wearing a hard hat in there! 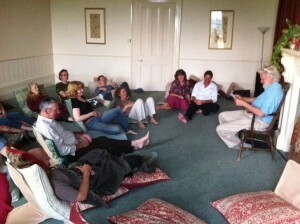 Since then, we’ve had Alec Jones’s Dragon Spring Tai Ji School’s Summer Retreat here. The sunnier weather held for them so they were able to play Tai Ji in the gardens. It’s lovely sitting in the office seeing people playing the form on the lawn! 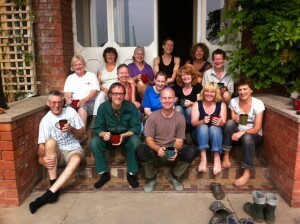 The day after they left, we were joined by Marianne Murray with her Holotropic Breathwork group. Marianne is an annual Poulstone regular and we had a great week with her and the group. They rounded off the week with a fire outside in the walled garden on their last night. So we now have a couple of days to get organised ready for the start of the work retreat – time to walk round the garden and house and look at the jobs that need doing, check all the tools are where we thought they were (!) and so on. It’s always a lovely week, hanging out with old friends and new, and we’re looking forward to it. Poulstone Court Retreat Centre P.S. These heleniums are our favourites of the moment – and the bees love them!